Salem, OR—Governor Brown today visited Bend, where she attended the Bend Venture Conference and met with local entrepreneurs. 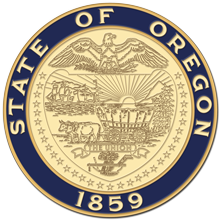 Additionally, Governor Brown celebrated Central Oregon's growing outdoor recreation industry and ceremonially signed HB 3350, which creates the Office of Outdoor Recreation within the Oregon Parks and Recreation Department. "Whether it's kayaking along the Willamette River, hiking through the Little North Santiam Trail, or skiing at Mt. Bachelor— venturing outdoors is not just good for our health, it sustains a booming outdoor recreation industry throughout Oregon," Governor Brown said. "The newly created Office of Outdoor Recreation will connect more Oregonians to the outdoors, which in turn supports Oregon's innovative and world-renowned outdoor recreation retailers and businesses." The Office of Outdoor Recreation is expected to open in January and will coordinate outdoor recreation policy across public agencies, with outdoor recreation retailers, companies, and tour operators, as well as with organizations that have a vested interest in seeing Oregon's outdoor recreation reach its fullest potential in every corner of the state. Oregon's outdoor recreation industry contributes to Oregon's thriving economy, and supports over 20,000 jobs for Oregonians. Many of the state's outdoor recreation and athletic companies are centered in Central Oregon, including a leading climbing wall manufacturer, Entre-Prises, which Governor Brown toured while in Bend. The company employs about 50 local residents and is part of a growing number of outdoor recreation businesses within Oregon. Also while in Bend, Governor Brown ceremonially signed HB 2100 that designates all 451 miles of US Highway 20 in Oregon as the Oregon Medal of Honor Highway. The highway is the first of its kind in the nation and honors Oregon's 26 Medal of Honor recipients who served during 8 major wars in 10 countries over 108 years from the Civil War to Vietnam. Governor Brown joined in the unveiling of the Medal of Honor Highway sign and recognized Bend resident, Mr. Robert. D. "Bob" Maxwell, the nation's oldest living Medal of Honor recipient. Mr. Maxwell is the only Medal of Honor recipient living in Oregon, who turns 97 on Oct. 26.